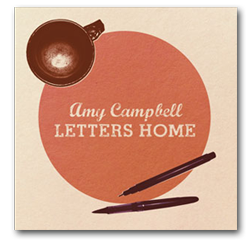 After an acclaimed debut back in 2008, and previous time in the group Stumble, the Halifax-born, Toronto-based folk singer-songwriter Campbell makes it back into the recording studio for this follow-up. Produced by longtime Ron Sexsmith/Rheostatics/Bidiniband drummer Don Kerr, it's a precise and meticulous work, with well-crafted songs and well-chosen words. Strong and intimate, this is the music of relationships and bare hearts, stripped down to its essentials. Distance plays a big part, being away from the "one thing that can make me feel right". Kerr's subtle production keeps the focus on the lyrics and melodies, with just the gentlest touches of acoustic bass, brushed drums, sweet strings and real piano joining Campbell's acoustic. It's modern folk with classic touches.